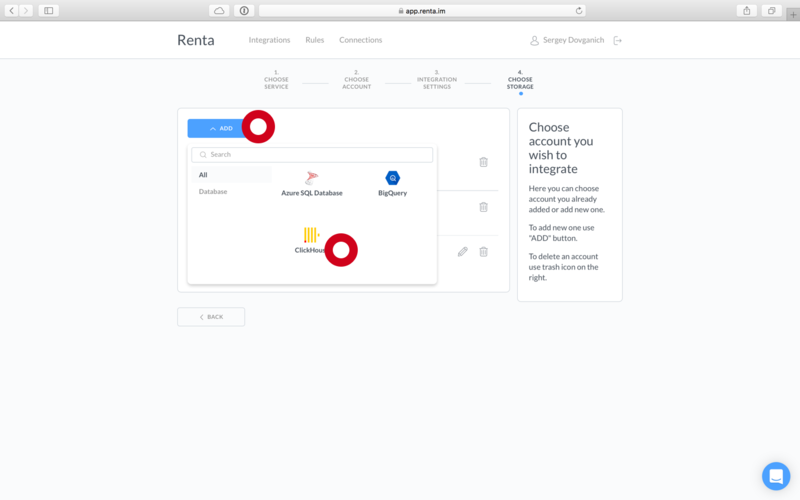 Renta automatically downloads statistics from the account in Yandex Direct. After that it saves the data to Clickhouse, Google BigQuery or SQL Server. 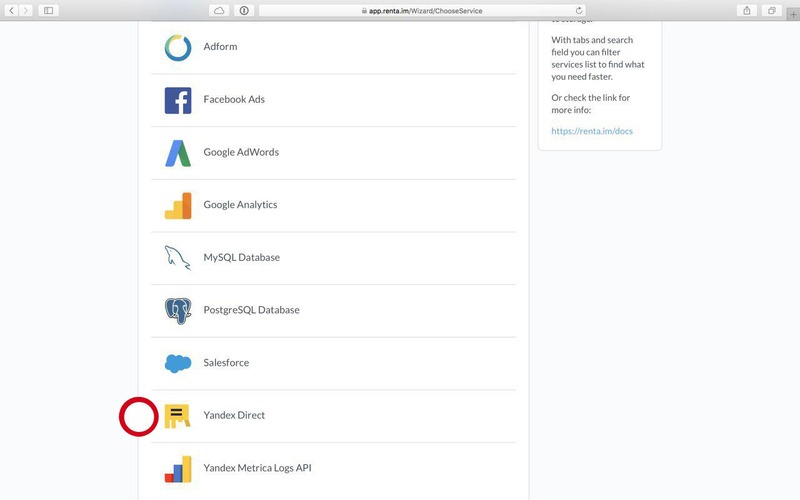 To integrate Yandex.Direct with the Clickhouse database, follow the steps below. At the first step, select the integration type.In our case this is Yandex Direct. 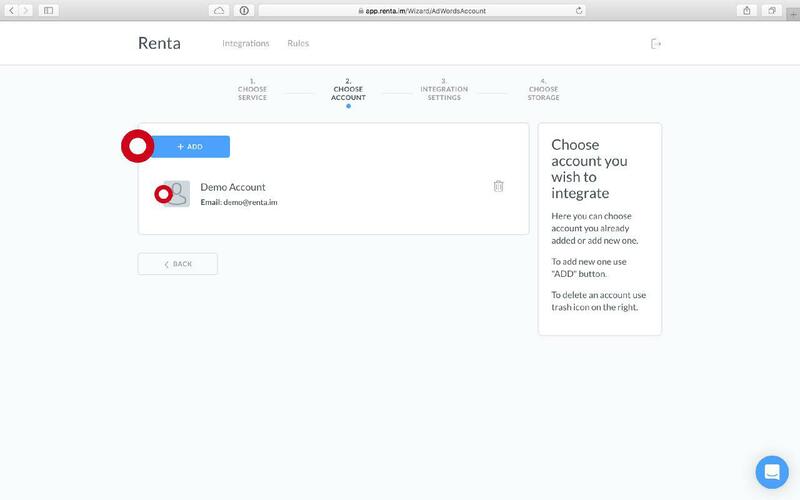 Then you will see a window where Renta will ask for access to your data. Report type: select the type of report. 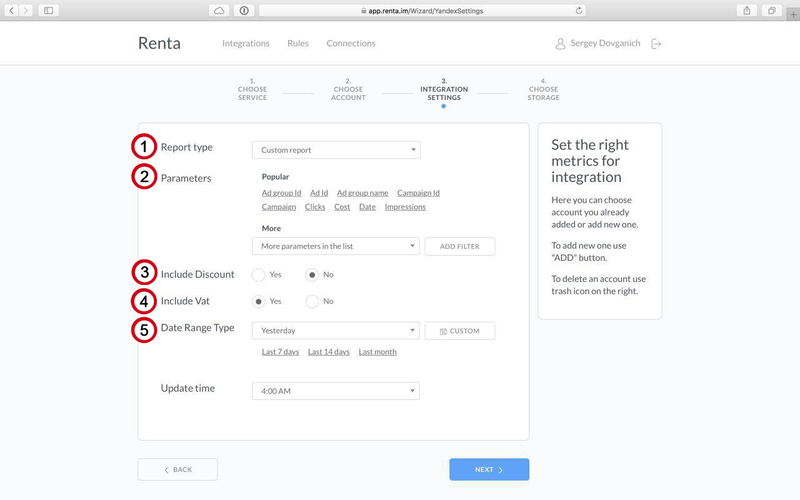 Renta supports all types of reports available in the Direct’s API. This is important as the type of report influences the set of available fields and data grouping. For instance, you selected CRITERIA_PERFORMANCE_REPORT, then data in the report can be grouped by the group identificator AdGroupId and targets CriteriaId and CriteriaType. Parameters: select the necessary parameters for the upload in a table. You need to remember that parameters depend on the type of report. Include Discount: specify the discount if you are using the agency account. You need to know that agency fee will be charged from the cost of clicks. Include Vat: whether VAT should be included in the cost per click. Date Range Type: specify the time necessary time period for the data you need to download from Yandex.Direct. For instance, if you need statistics for the last 7 days, specify «Last 7 days». If you want to download data for a certain period of time, then click on the Custom button and specify dates in the «To» and «From» fields. If you want the data for the last day to be collected automatically, specify “Yesterday” in the “From” field. Update time: specify the time for a regular data download from Yandex Direct. For instance, every day at 7:00 AM. At the fourth stage select the type of database. To do that, click on the Add button and select Clickhouse, for example. Then you will see the Clickhouse authorization window. Specify the server address, login and password there. After a sign-in select the added Clickhouse server. After that Renta will automatically download the necessary data.